Kean Cipriano posted a photo on Instagram that fueled the pregnancy speculations as a baby bump on Chynna was more evident than previous Instagram posts. Following the surprise wedding of Kapuso actress Chynna Ortaleza and Callalily frontman Kean Cipriano before the start of 2016, the couple welcomed the new year with speculations that they were already expecting. But on Wednesday, March 23, Kean posted a photo on Instagram that fueled the pregnancy speculations as a baby bump on Chynna was more evident than previous Instagram posts. Again, the couple did not confirm nor deny anything about the photo, but fans went on to congratulate them on the comment section. CHYNNA IS PREGNANT. 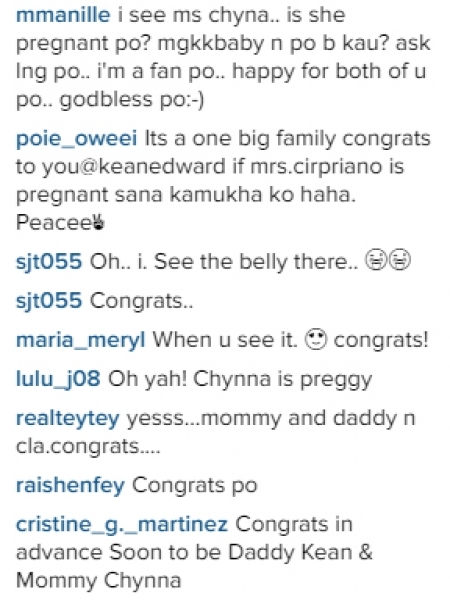 A source confirmed to PEP that Chynna is indeed pregnant and is due to give birth next month. She and Kean are going to have a baby girl! Just so sad that Kean's dad will not be around for such a happy event. Kean's father, Edgie Cipriano, passed away last March 17 due to cardiac arrest. Kean belongs to a family of three boys, so this will be the first time that they will have a girl in the family. And according to insiders, Kean and Chynna love each other very much.